I've been making so many new donabe dishes, but it's been too busy and I haven't been able to update my blog with recipes past months. So, starting today, hopefully I can post donabe recipes more often! I have been enjoying seafood from Kai Gourmet past months, and they provide such high quality seafood. They deliver to anywhere in the US, so I highly recommend! Many of the seafood come from New Zealand (both wild-caught and sustainably farmed kinds) and is delivered within 36 hours from the waters. I order different kinds of seafood every week, and my donabe life has been even happier. They offer the best quality barramundi (of course, never been frozen) you can get in the US. 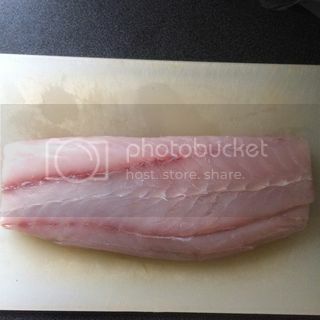 It's a white flesh fish like sea bass or snapper. But, I think barramundi has more buttery texture, which I really like. I made a simple steam-fry dish with barramundi and napa cabbage in my tagine-style donabe, "Fukkura-san". You can substitute barramundi with sea bass, snapper, grouper, or even salmon, if you like. The dish takes no time to prepare, and the flavor is so wonderful. Combine the ingredients for the broth. Set aside. Sprinkle the salt all over the fish and set aside for 15 - 30 minutes. Pat dry. In the skillet of "Fukkura-san", heat the sesame oil over medium heat. Sauté the ginger for 1 minute. Add the bottom half of the napa cabbage and sauté for another 1 - 2 minutes. Pour in the broth. Break apart the shimeji and add, then spread the fish pieces on the surface. Cover with lid and cook for 7 - 8 minutes or until everything is cooked through. Garnish with scallion slices, and serve into individual bowls at the table. You can also find the recipe in toiro kitchen's website.